i have to admit i have become more fascinated by the nodal axis of the moon whether it is transiting and making connections to points in a chart, or more generally where it is placed natally..
canada seems to be experiencing a strong bit of political fallout at present on the national stage thanks to a few financial matters involving a few senators and now having the chief of staff - nigel wright) for the prime minister stephen harper) the 2nd most powerful position politically, although not an elected position - giving his resignation..
here is canada's chart set for midnight and one that is commonly used for canada. there are 1 or 2 others for the same date, but the midnight chart is the one i have used for many years. canada is in the process of experiencing it's saturn return which i believe is in the 8th house in the sign scorpio. this is the approx area where the transiting nodal axis is at present and where the eclipses have taken place roughly speaking. below is a noon chart for nigel wright the former chief of staff for the pm. i believe, but don't know for certain that he was born in toronto or the area of toronto.. below that is an interesting article on him from a year or so ago.. hopefully it will take 3 links here! 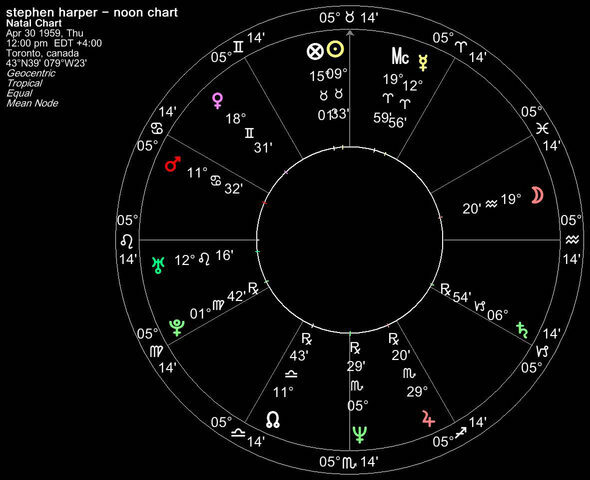 here is a noon chart for the prime minister stephen harper. 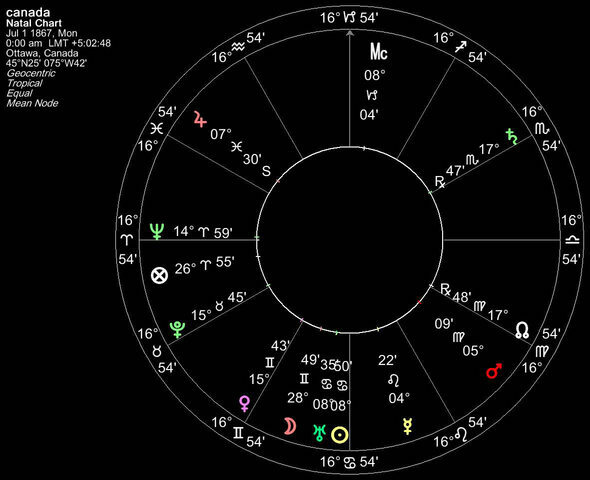 one notes the transiting saturn opposite his natal sun, while transiting uranus is conjunct mercury/south node.. natal mars is square the nodal axis/mercury, so this uranus transit is more unsettling/destabilizing then ordinary.. both harper and wright have a mars/saturn opposition in their charts.. they represent the 'conservative' party here in canada. both are taurus sun as well.. I remember, maybe a small handful of year ago, mentally noting a Pluto transit would come to conjunct that Canada chart's Midheaven. Harper being PM; seemingly in total control of his party. That is how it done in the 2 party system Canada, UK, and US use. Whichever side can't get it together becomes the minority. Did we ever experience this Pluto? Was Harper with a majority government it, and it's done now? It basically took Harper's political life so far to achieve a majority. Pluto isn't coming back to 8cp04 again anytime soon. A time when, in Canada, one guy gets some actual control, enough to dent up Canada's image a bit? Stephen Joseph Harper (born April 30, 1959), PC, MP, is the twenty-second and current prime minister of Canada and leader of the Conservative Party. Harper became prime minister when his party formed a minority government after the 2006 federal election. He is the first prime minister from the newly reconstituted Conservative Party, following a merger of the Progressive Conservative and Canadian Alliance parties. The Conservative government will bring legislation before the House of Commons as early as Monday to set fixed dates for federal elections and to force Parliament's upper chamber to stand for election rather than rely on political appointments, Prime Minister Stephen Harper says. the Duffy/Nigel thing could be a well planned something to encourage some sort of electoral reform. Nigel's motivations for dropping 90k would be my prime curiousity. to my eye, that might be nice, Duffy looks like he belongs in a hospital, not as an electoral system sanctioned advisor to a goverment. Why not just let him take the fallout for accidentally overspending 90k without noticing. He's either 1/2 braindead or a criminal. To Nigel: there are more deserving charities. my version of morinus software will not let me do primary directions to anything over 100 years old - thus the chart for canada is un workable in morinus when it comes to reading primary direction data.. however i have found that converse solar arc directions often mimic primary directions - although that might be blasphemy to some, lol.. i will comment on these in a moment but first i want to comment on your focus on pluto transit to the midheaven..
to me it isn't a big deal. if it was, what became of it? i think if i am to think of what has happened in canada politically of significance in the past 10 years it would be what you allude to in the merger of one right wing party - alliance or reform, with the other right wing party that was essentially decimated to a non party when mulroney last ran.. it is amazing what the role of the media has in resuscitating the conservative party on it's death bed by convincing this reform/alliance party of how it must now adopt the name of the dead conservative party.. i suppose this had a lot to do with these same politicians and the media just rubber stamped it without question.. same thing happened in b.c. politics - socred party becomes liberal party, lol.. the alliance/reform becomes the new conservative party had a lot of imagery i associate with pluto.. dead, but resurrected from the dead, lol.. and it reinforces the idea that those in power will hang onto power and you can never count them out in spite of chopping off their head in that election where mulroney and the conservatives had all of maybe 2 seats for the whole country and lost there political party status and perks that go with it... but all that was back in 1993!!!!! they technically dissolved the pc party in dec 2003 around the time of saturn conjunct canada's sun/uranus conjunction.. to answer your question "Did we ever experience this Pluto? "- i am not convinced of how important pluto is to an understanding of a chart at this point based on my observation that these monument event/s already happened... what do you think? perhaps a better question at this point might be - which house has a direct connection over matters like the senate, or representatives like chiefs of staff for the pm, that are not elected positions, but ones that go with winning an election? my guess is the 11th house, but i am curious to know what others think. if it is the 11th house then we are back to the traditional or modern rulership of saturn/uranus to aquarius on canada's 11th house cusp.. note how the nodal axis at 15 scorpio/taurus at present lines up with the saturn/pluto opposition running across the 8/2 houses and squaring onto the 11/5 houses.. the improper use of and exchange of money related to both duffy and wright seems to be captured in this moment thru the transit of many planets including the recent solar eclipse thru taurus 2/8 houses.. it seems the 90 grand pay off was an attempt to avoid any full audit of duffys account, perhaps due the fact he was making political donations to see the conservative party re-elected again.. no wonder someone from the same party wanted to bail him out..
perhaps aside from the general action in around the taurus/scorpio axis one could consider the exact solar arc direction of neptune opposite jupiter in the 11/12 house area..transit neptune is also very close to a conjunction of jupiter at this time as well.. these gifted positions that senators are given come with a salary of 135 grand. many canadians do wonder the integrity of it, and the political system we have as a consequence looks very shoddy from an untrained eye. perhaps we'll get more insight from the solar eclipse of nov 3rd 2013 when the planets align with saturn and in the same area of canada's natal saturn in the 8th house/sign..
they essentially mirror one another.. it is a little bit like the antiscia concept..
the transiting nodal axis is at approx 16 scorpio/taurus. this happens to be right where the natal pluto/saturn opposition is in canada's chart. 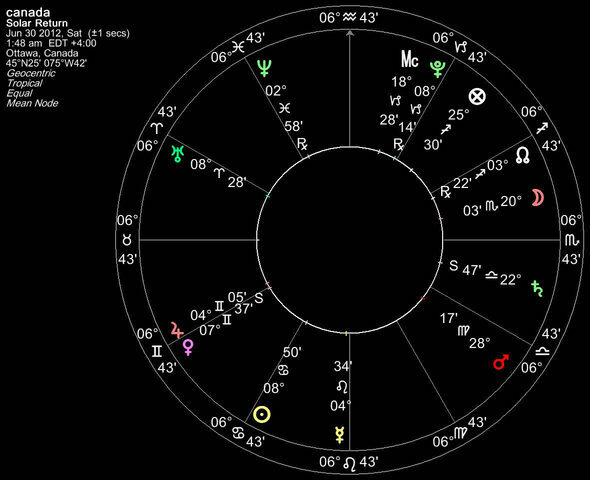 in the converse solar arc directions the c sa midheaven opp sun/uranus is presently at 15/16 aquarius/leo. OTTAWA � The NDP launched a "roll up the red carpet" campaign Wednesday to abolish the Senate in the face of a growing spending scandal that has followed Prime Minister Stephen Harper to South America. NDP Leader Thomas Mulcair used the Senate as backdrop to announce he would hit the road to win provincial and territorial support to open the Constitution to abolish the upper chamber. Mulcair described the Senate as a dumping ground for party bagmen, political organizers and defeated candidates. "The Senate cannot be reformed," Mulcair said. "It's become a scandal that won't go away for Mr. Harper." Harper departed on a trade mission to Peru and Colombia on Tuesday after he described events in the Senate as a distraction. He was expected to take questions for the first time on events Wednesday. His chief of staff resigned on the weekend after questions were raised about the appropriateness of gifting $90,000 to Sen. Mike Duffy to help the former journalist return money he collected in housing allowances. Two other senators � Mac Harb and Patrick Brazeau � are also embroiled in the housing allowance controversy, and a third � Pamela Wallin � is awaiting the results of an audit into travel expenses. Both Wallin and Duffy resigned from Conservative caucus to sit as independents. Harb, a Liberal, also sits as an independent as does Brazeau, who was kicked out of caucus over assault charges. The federal ethics watchdog is investigating Wright's payout to Duffy. A Senate committee that has been accused of whitewashing its original report into Duffy's expenses has decided to take another look at the books in light of new allegations Duffy was billing taxpayers for non-Senate business. In the course of time, when Pluto eventually enters Capricorn and challenges the Sun in Canada's birth chart, certain internal political dilemmas may finally come to a head and demand resolution. In the meantime, this nation has, perhaps, not yet woken up to its full creative and cultural potential. It is likely that over the next few years this is where the energy will flow in the national psyche. Whether or not you take advantage of this trend, and participate in what could prove a real cultural renaissance, is up to you. But Pluto is quite easy to spot... looks important and exotic like one of those built in events one usually finds rectifying after the facts. solar returns or revolutions are worthwhile to consider. i think of them like a focus on transits, but they are more then that! i still think they were used as a secondary technique to primary directions, but that doesn't make them any less relevant. i am inclined to go back to using solar arc directions, not just because they are easier to get, but if primary directions are all they are cracked up to be the astrologers professing this sure are gun shy giving examples out front, or in retrospect..
here is a type of order i have used for prioritizing information from a few different techniques.. if you have an accurate birthtime, i think the angles are the most fascinating and significant consideration.. these are the moving angles represented by the solar return for 2012 or 2013. if they are in contact with something in the natal chart then i think that really gets emphasized. let me try to give an example using the 2012 solar return for canada put to ottawa the place of canada's government..
in this chart the sr ascendant/descendant at 6 taurus/scorpio 43 lands in canada's 2/8th house sign axis.. a focus on finances would seem to be suggested more as a result. the sr midheaven at 18 cap 28 lands in canada's 10th house/sign is being squared by sr saturn at 22 libra and both in turn hard aspect onto the natal neptune in the ascendant. to me this speaks of the present cloud over the government in power at present and really highlights the issue of accountability and whether the canadian people are going to get any from those in power..
at the same time the position of sr pluto is making the exact conjunction to canada's midheaven as you note, which in turn is in direct opposition to canada's sun/uranus conjunction in the 4th.. perhaps big changes in connection to the senate are in the works. the solar return chart seems quite appropriate with the ruler of the ascendant - venus - in the 2nd conjunct the natal 12th house ruler jupiter and stationary about to go direct, both conjunct the south node in the 2nd as well, with jupiter in the sign of it's detriment.. that seems to be the senators in question and their money issues.. all this is easier in hindsight, LOL..
another interesting observation in connection with these solar return angles is how saturn transit is right on the descendant at the time of all this fall out at 6 scorpio 40 for may 19th the date of the chief of staff's resignation. i don't know if anything has rocked the harper government as strongly as this, in spite of their hard work at image maintenance..
the sr moon at 20 scorpio sitting on this saturn/pluto opposition in canada's chart is another testimony to what we are witnessing. sr uranus in the 12th house squaring directly onto canada's sun/uranus opp midheaven is another good testimony of the surprising nature and unsettling result that we see unfolding. all in all the solar return for 2012 is very good at capturing the symbolism connected to these recent events. i think this further strengthens some of those solar arc directions i had mentioned in the previous post.. if the solar return for 2013 is any indication the desire for change among canadian citizens might be realized with the midheaven/uranus/moon conjunction sitting on canada's ascendant/neptune. this suggests new beginnings to me.. here is the solar return chart for 2013 set to ottawa. maybe you'd like to comment on this chart? venus rising! ruling and independent persons impeded. Loss of sovereign persons. September 2003: Mac Harb (Ontario) appointed to the Senate on the advice of Prime Minister Jean Chr�tien. Dec. 22, 2008: Conservatives Mike Duffy (P.E.I. ), Pamela Wallin (Saskatchewan) and Patrick Brazeau (Quebec) among 18 people named to the Senate by Prime Minister Stephen Harper. June 13, 2012: Auditor General Michael Ferguson recommends the Senate require documentation for more of senators' expense claims, after finding the Senate did not have proper documentation to support living expense claims in two of seven cases examined. Nov. 21, 2012: Marjory LeBreton, government leader in the Senate, asks the Senate's board of internal economy to determine whether Brazeau's housing allowance claims are appropriate, following a CTV report questioning Brazeau's residency and housing expense claims. Dec. 6, 2012: Senate internal economy committee announces it will conduct an audit to assess "whether all senators' declarations of primary and secondary residence are supported by sufficient documentation." Documentation includes provincial health card, driver's licence and voting registration. Feb. 4, 2013: P.E.I. Health Minister Doug Currie confirms to CBC News that Duffy applied for a provincial health card just before Dec. 25, 2012. Feb. 5: CBC News reports that a property tax assessment shows Duffy does not receive a P.E.I. resident tax credit for his Cavendish home. Feb. 7: Wallin tells reporters on Parliament Hill that her home is in Saskatchewan and she is complying with residency requirements. Feb. 7: Brazeau is arrested on charges of sexual assault and assault. He is immediately removed from the Conservative caucus and appears at a Gatineau, Que., court the next day. Feb. 8: Senate announces it has hired outside auditor Deloitte to examine the residency declarations and related expenses of Duffy, Brazeau and Liberal Senator Mac Harb. It is also seeking legal advice about Duffy�s residency status. Feb. 12: The Senate votes to put Brazeau on forced leave pending the outcome of the criminal case. Feb. 13: In an interview with CBC Radio, Wallin says she has declared for Senate officials that her primary residence is in Saskatchewan. In a separate interview, Wallin says she met with Deloitte for an audit of her travel and living expense claims. Feb. 13: Harper in question period: "In terms of Senator Wallin, I have looked at the numbers. Her travel costs are comparable to any parliamentarian travelling from that particular area of the country over that period of time. For instance, last year Senator Wallin spent almost half of her time in the province she represents in the Senate. The costs are to travel to and from that province, as any similar parliamentarian would do." Feb. 14: Senator David Tkachuk, who heads the Senate's committee of internal economy, says the audit of Wallin's travel expenses began as the first of a series of "random" audits by the committee after the auditor general's June 2012 report critical of the way some senators filed claims. Feb. 22: Duffy tells CBC News in P.E.I. that he and his wife "are going to voluntarily pay back my living expenses related to the house we have in Ottawa." He blames the expenses controversy on a confusing residency declaration form and unclear rules. March 1: LeBreton tells CBC News via email that "Senator Duffy maintains a residence in P.E.I. and is qualified to sit in the Senate." March 26: Auditor Deloitte receives a letter from Duffy's legal counsel stating that Duffy had repaid more than $90,000 in expenses, and would no longer be participating in the audit. March 27: A revised Public Declaration of Assets (external link) for Harper's chief of staff, Nigel Wright, reveals he no longer holds stock options in the private company RSI Executive Investco LLC. March 29: Senate figures show Duffy claimed $5,519 in living expenses for the three-month period ending in February, higher than the amount claimed in previous two quarters. April 18: Duffy appears to tell Global News he is waiting for the results of the outside audit to decide whether to repay any housing and living expenses. April 19: Duffy issues statement saying he has repaid more than $90,000 in housing and living expenses. Senate committee on internal economy confirms $90,172.24 repayment, but does not say when payment was made. April 20: Deloitte receives, from Duffy's lawyer, a copy of a letter Duffy sent to Tkachuk offering to meet with the Senate or Deloitte. Deloitte later says it understood the Senate subcommittee had notified Duffy the "offer to meet with Deloitte would delay the process, and that the subcommittee agreed that there should be no further delays in the process." May 9: Senate releases outside audits and committee's reports on Brazeau, Duffy and Harb. The committee orders Brazeau and Harb to repay $48,000 and $51,000, respectively. Harb quits the Liberal caucus and vows to overturn the committee's findings; his expenses are to be further audited for the previous seven years. Harb, Brazeau and Duffy are placed under greater scrutiny for a year. Report on Duffy's expenses notes the senator had already repaid $90,000. Senate announces that an audit of Wallin is ongoing. May 9: Harper in question period: "Mr. Speaker ... an independent external auditor was brought in to examine all of these expenses. He looked obviously at the expenses of three particular senators who have had some difficulty. The auditor has concluded that the rules in place were not clear, however, the Senate itself has decided it expects better judgment from the senators. Senator Duffy some months ago repaid the money and the Senate has decided that other senators will be expected to similarly repay those amounts." May 12: RCMP confirms it is looking into Senate expense claim audits. May 14: NDP demands release of legal opinion on Duffy residency. LeBreton says Duffy meets all residency requirements. May 14: Brazeau says in a press release that he met the Senate's own rules for housing expenses and calls for a public hearing on his case. May 15: Following a report by CTV News, PMO spokesman Andrew MacDougall confirms the prime minister's chief of staff, Nigel Wright, wrote a personal cheque for $90,172.24 to repay Duffy�s living expenses, and says the cheque was a gift, not a loan. Conservative spokesman Fred Delorey says "no party money involved in any way" in Duffy repayment. Duffy and Wright decline comment. May 16: Mike Duffy quits the Conservative caucus to sit as an Independent senator "pending resolution" of the expense questions. "Throughout this entire situation I have sought only to do the right thing. I look forward to all relevant facts being made clear in due course, at which point I am hopeful I will be able to rejoin the Conservative caucus," Duffy says in a statement. PMO says Nigel Wright has the "full confidence" of the prime minister. May 17: PMO spokesman says Wright is "staying on." May 17: Pamella Wallin releases a statement saying she has recused herself from the Conservative caucus. Wallin says she has been co-operating "fully and willingly" with auditors and adds that she will have no further comment until the audit process is complete. Senate government leader Marjory LeBreton says in a statement Wallin informed her she has "resigned" from caucus to sit as an Independent. May 19: Nigel Wright resigns "in light of the controversy surrounding my handling of matters involving Senator Duffy," adding he did not tell Harper of the repayment "either before or after the fact." Harper says in a statement he accepted Wright's resignation "with great regret." Ray Novak, Harper's principal secretary, takes over as chief of staff. May 21: Prime Minister Stephen Harper allowed journalists into a Conservative caucus meeting while he spoke to his MPs and senators. He told them he was "very upset" about the recent conduct of "some parliamentarians" and his own office but he did not name names and did not specifically address the Senate spending scandal. He did not take questions from reporters and they were asked to leave when he was done speaking. The Senate decided to send Duffy's audit report back to its internal economy committee for a second review. I've noticed that this interesting thread on Canada, initially started by James M, a few years ago, has also been dormant for quite a while! Here are my thoughts on the national chart of Canada, (current to March 1st, 2018). I am Canadian, born and raised, and have practiced astrology in four Canadian provinces, for whatever that is worth ? The Dominion of Canada was "born" on July 1st, 1867, in Ottawa, Ontario. There are two well known charts currently in use. 12 midnight, which gives 16 degrees and change of Aries rising and a second chart for 12:05 pm, which astrologer Rab Wilkie introduced to us back in the 1980's. Most countries belonging to the Commonwealth and the former British Empire typically start their independance officially at 12 midnight. However, it must also be said that Canada did not obtain their own constitution until 1982, (over 115 years later) so it's not really an independance chart, is it ? The 12:05 pm time is NOT speculation, but based on a public ceremony held in Ottawa at 12 noon, that day, with a public gathering and verbal proclamation, followed by blasts of cannons. However, according to a Ottawa newspaper article of the event, the ceremony got delayed by five minutes, due to a "cannon malfunction !" LOL I wonder if the cannon malfunctioned because it was made in China or India! (just kidding). I would have to say, though, the 12:05 pm chart, overall, with nearly 8 degrees of Libra rising makes much more sense to me, in terms of progressions, transits, and many other things, including the overall persona of Canadians. The midnight chart of 12 am is inherently flawed, as it gives a void of course Moon in Gemini, which, again, does not describe well, the Canadian people or Canada's women. I am actually a Sun in Gemini, which conjoins the midnight Moon, but that has not benefitted my career, at all, but has hindered it ? Such is the treachery of living and working in Canada, a highly overrated place to live, in my opinion. Unfortunately, there is no happy ending, in site, so I guess that I am stuck here ? 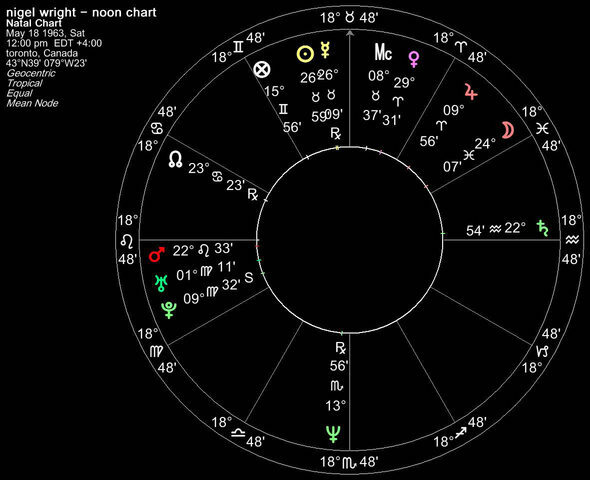 The 12:05 pm chart puts the chart ruler, Venus, in the 9th house, in Gemini, while the Moon in Cancer is also found in the 9th house. Libra rising accounts for the sheer beauty of Canada (the world's second largest country by physical size) and the 9th house, along with Moon trine Jupiter, emphasizes Canada's sheer size and vastness, which is a 9th house/Jupiter theme. Canada also projects niceness to the entire world, a Libra theme, no doubt. The emphasis on the 9th house shows how foreigners, namely England, but also the United States and France, have placed a "detective's finger" on our affairs since time eternity. There have been no shortages of foreigners trying to manipulate the Canadian people, either. Since Moon and Venus are in the 9th house of foreigners, that would show America's close and vital relationship with Canadians, economically, militarily, culturally, etc. With Canada's Moon conjunct the USA Sun and Venus in Cancer, that would likely say it all ! That said, the USA Saturn conjoins the 1st house of the Canadian chart, so you Americans act as a brake or retardant on our affairs, either unconsciously or deliberately ? Since 9/11, the U.S. government has increasingly tested that relationship, by harassing Canadians of Muslim and Asian origin when crossing their border, denying them entry, etc. while border agreements signed with Americans while George W. Bush and Obama was in power, essentially give up our sovereignty and allows U.S. customs agents to wear guns while working our airports, a disturbing trend. With the Libra rising, however, the tendency to be "soft" and cave in to others is a noted feature of Libra (and which I don't agree with). The Moon's close conjunction with Uranus, trining Jupiter, corroborates the railroads that were critical in bringing British Columbia and Alberta into confederation, according to historian Pierre Berton's book, The Last Spike. Moon = Uranus has brought socialist-type values to the plate, such as universal medicare, welfare, unemployment insurance and the like, which has since been emulated by other countries? The current transits and progressions for 2018 show major challenges to the Justin Trudeau goverment currently in power, as SP Moon is opposite the stellium (Sun, Uranus, Moon) in Cancer.The conflict of interest scandal involving Finance Minister Bill Morneau is among them, HOWEVER, I fail to see the government falling over that one. With transiting Saturn opposite the Moon and the rest of the stellium, public confidence in the leader will be at an all time low and this will have negative consequences for Justin Trudeau headed into the 2019 election. With SP Moon squaring Neptune later this year, that might bring a new scandal of a legal nature for the Liberal government, or a major deception uncovered, that will further undermine Trudeau's political future. Fortunately, SA Jupiter conjunct n. Mercury shows growth and prosperity with Canada's overall employment scene and health care funding will also get a significant boost. That aspect also keeps the current government in power? T. Saturn and SP Moon in the 4th house indicates that lack of affordable housing is at an all time low and many Canadians are suffering. Unfortunately, I dont see any government handling the issue, properly, and there will be continued injustices. Marijuana will be decriminalized in July of this year, as SA Pluto opposes Neptune. That may be problematic for the government, though, in terms of collecting/sharing any taxation revenue, perhaps due to the underground economy competing with the government. There will be key reforms made with native rights and insuring more fairness within the courts. However, with SP Moon squaring Neptune, there could be wasted opportunities, as well? or just out and out deception by the federal Liberals. Notably. natal Jupiter in Pisces (exalted) is found in the 5th house of sports. That shows an upward progression of Canada's Olympic athletes and the fact that Canada won 29 medals at the 2018 Pyongyang Olympics, an all time record for this country. However, when Sa Venus conjoins natal Saturn in approximately three years, I wonder if funding might get slashed by a future government less sympathetic to athletes and sports, in general. I predict a major belt tightening in Canada, due to either a recession coming up or and just a "cheap" government taking power, likely the Conservatives replacing the Liberals, at some point, I predict. It is worthy to note that the closest aspect in the national chart is Venus inconjunct Saturn in the 2nd house of resources and assets. About the inconjunction, difficult to resolve, kind of like a hand held wooden platform with a hole in the middle, while a steel ball rolls above. The trick is to level the board, carefully, so the ball enters the hole. But, until that happens, frustration ! This aspect implies an inherent conservatism about Canadians, based on a fear of poverty or lack of money. (Of course, we all fear that). The trick with the 150 degree aspect is to somehow reconcile two planetary energies e.g. cheapness and frugality, in this case, with the "good life," as symbolized by Venus. Therefore, what this aspect can symbolize is extremes in behaviour, ie, excessive spending and indebtedness, followed by severe austerity and even, cruelty. So, after you scrape away all that Libra sugary goodness and kindness, there is an inherent cheapness about Canadians that reveals a darker side. For example, the Stephen Harper government cut to the bone, essential government services such as call centers for the tax department, the work department (Service Canada) and other essential services, and firing most of British Columbia's meterologists, and replacing them with robots. The Trudeau government is no better and those workers never got replaced, so, in fact, they have continued the cheapness of the Tory cutbacks. In some cases, they have loosened the purse strings, but the Canadian public is essentially confused. now, and people cannot communicate with any government department or Ministry, anymore? Everyone in government tends to hide behind their emails or voicemail and there is no accountability to the Canadian taxpayers. So, things are in a bloody mess. Finally, regarding the thorny issue of Quebec's seperation from Canada, Quebecers gave the "no" vote, twice, as many of you will remember. However, the issue is not finished, not by any means. In the December 1982 edition of Dell Horoscope Magazine, Ottawa astrologer Shelagh Kendal wrote an interesting article about Canada and the prospects of Quebec seperation. Shelagh (whom I did meet back in the 1970's at an Ottawa astrology workshop) did predict that Quebec would eventually seperate from Canada, (much like Scotland will ultimately seperate from England). And I agree with Shelagh, that that will happen, one day? And, if and when that happens, I may have to make a very important decision. For example, to return to my home province of Quebec and possibly, give up my Canadian citizenship. If Quebec does like Isreal did, by inticing Isrealis back to their homeland with tax breaks, offers of free land and accomodation, that might sweeten the pot for me ? But, here's the problem. My natal Neptune falls in the 4th house of home. So, I have to figure out, who will scr*w me over, more; the government of Canada, or the government of Quebec. That's NOT an easy answer, folks ! Anyhow, that was my TWO CANADIAN CENTS. Since you claim to live in Canada, you should know then that, in this country, we have due process and people are innocent until proven guilty and the same goes with Senator Mike Duffy. Therefore to call Duffy "half-brain dead and a criminal" shows your darker side. After your posting, 31 criminal charges against Mike Duffy were eventually laid, but an Ottawa judge declared Mr. Duffy not guilty to ALL 31 CHARGES back on April 21st of 2016. Duffy is now suing the senate and the government for 7.9 million dollars for losing his reputation. In fact, after that well publicized court case, the federal government dropped all fraud changes against Senator Pamela Wallin, Senator Patrick Brazeau and a third Liberal senator, who retired (Mab Harb). Once the public heard of Duffy's court win and the whole Nigel Wright debacle, the Canadian public had had enough of Harper and it was pretty clear that the Duffy prosecution did serious damage to the Conservative Party's re-election chances, in that they lost badly to the Trudeau Liberals at the next federal election and many Conservative cabinet ministers got defeated. Re: senate reform, Mr. Trudeau, as part of his 2015 election platform, promised to reform the senate. But after he got elected, he flip-flopped on the issue and decided to keep the status quo. One of MANY flip-flops, it must be said ! Thanks for posting that graphic, James. I tried several times to post, myself, with my own charts and a chart from astro.com but it didn't allow it. When I shrunk down the image smaller than 600 x 600 pixels, the same thing happened? Go figure. If you've noticed, Saturn, by transit, is almost 90 degrees square, the natal Libra ascendant. Last week, it opposed Moon in Cancer, while the Moon rules Justin Trudeau, and the 10th house leader of the country. Last week, Mr. Trudeau went to India to promote Canadian business. But, he was severely criticized for allowing a known convicted Indo-Canadian to attend a reception while in India and therefore, someone made a serious security lapse. (Saturn opposite Moon in the 9th house of foreigners). As a former member of the International Sikh Youth Federation (a banned terrorist group in Canada and India), Jaspal Atwal was convicted of the attempted murder of an Indian cabinet minister in 1986. Atwal also was convicted of a vicious assault on former BC Premier Ujjal Dosanjh, yet he got an invite to a PM event. How he even got clearance to visit India, with his criminal record, is even more mysterious ! Trdueau's response to the incident was that a liberal mp from surrey, b.c. "recommended" that the visit take place. But it shows that Trudeau has a blundering nature and that he takes things for granted.